Eniva Minerals for Life® Athletic Edge® Multi Minerals is a liquid dietary supplement of the Cell-Ready® minerals calcium, chromium, germanium, magnesium, potassium, selenium, sodium, sulfur and zinc in a proprietary nutrient delivery system. During intense training or competition, your body loses fluids, resulting in decreased circulating blood volume, lower overall water content of muscle cells, and depleted sugar levels. As fluid losses mount, physical performance declines. In fact, many experts feel that for every 1% of lost fluid, your body's performance declines by 10%. Ingredients: Purified water, magnesium (from magnesium chloride, and/or magnesium sulfate), electrolytes (sodium chloride, and/or potassium chloride, and/or calcium chloride), natural citrus flavors, sulfur (from magnesium sulfate, and/or zinc sulfate), sorbic and/or benzoic acid(s) (protect freshness), citric acid, chromium (from chromium chloride), selenium (from sodium selenate). Directions: Adults: Adults: 1 ounce daily (30mL). Do not exceed 2 ounces daily. Recommendations: May combine with 8 ounces of water or juice. pregnant, nursing or under age 18, consult doctor before use. 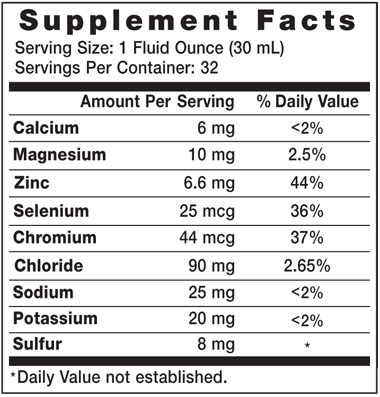 Isolated minerals or nutrients are best taken as part of a well balanced diet and broad supplement program. KEEP CAP TIGHTLY CLOSED. KEEP OUT OF REACH OF CHILDREN. I noticed a difference with the first spoonful. It is definitely supporting my workout and lifestyle in general.